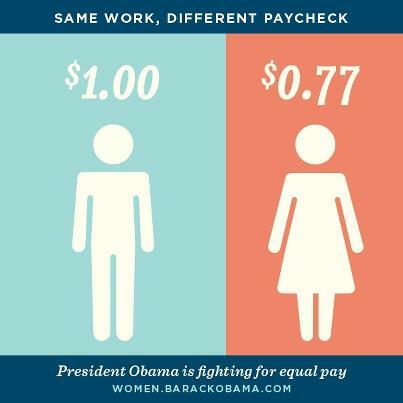 Yesterday was Equal Pay Day in the United States. And you probably didn't read any posts proclaiming HAPPY EQUAL PAY DAY! Because there's still a large earning gap as the meme shows: Women only earn $.77 to a man's $1.00. Sadly, the gap continues as it will take working mothers six months longer to earn the same amount as working fathers. 1) Tell-a-Vision: Share the new story of what you see happening in your community, state, and world for equal pay. Write a post or blog about this important topic today. 2) Vote: Mindfully choose your elected officials who represent your views. Check their voting records. 3) Research: Find out what your vendors pay men and women and support only those who practice equal pay for equal work. Do the same for the places you spend your hard-earned money! Vote with your wallet. 4) Pray: Take a moment to pause and pray for the leaders and decision makers who can make equal pay a reality to act now with courageous conviction. 5) Gratitude: Express your appreciation for the people and places you know practice the principles of equal pay for equal work. Handwritten notes are like gold--they are truly unwrapped gifts! Remember, money is an expression of spiritual energy being exchanged. Let all who determine the amount of money paid for a woman's work, experience an open heart and take inspired action to ensure it is equal, fair, and just.